Thecus® is proud to present itself as a technological innovator. Once again, Thecus® releases an all new 5-bay N5550 server to lead the competition. The past proves merit: link aggregation, LCM display, USB 3.0, multi RAID functions and so on. Impressive technologies have been used to develop the new N5550 NAS to serve one single purpose: improve user experience and satisfaction. Intel® Atom™ CPUs are designed to work without fans. This will dramatically reduce NAS noise and power consumption. Associated with large amounts of DDR3, Intel® Atom™ CPUs will provide much better performance. 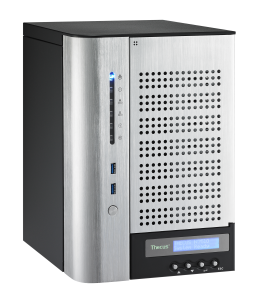 Don’t be restricted to a 4-bay NAS, bring it up a notch, Thecus® N5550 is available and boosts the best performance with a great price, without entering larger bay units. Multi-users environment, web hosting, intense backup, data encryption, application serving, heavy RAID computations, and HD multimedia streaming: welcome to the world of smooth multi-tasking! The N5550 NAS is McAfee antivirus embedded meaning that users can have confidence that their sensitive data will be protected by the most advanced antivirus software, McAfee. Thecus® started integrating USB 3.0 more than one year ago, enabling this blazing fast protocol on most storage devices by embedding a PCI-e slot. On popular demand, future NAS will equip at least one port for USB 3.0 transfer rates of 10 times faster than USB 2.0. After installing the proper module, simply plug a screen by the use of HDMI output, you don’t even need a computer anymore to check on your NAS! Local display via HDMI makes things that much more convenient, directly attach keyboard and mouse to start data management. The N5550 also supports VGA output for attaching traditional televisions, projectors and monitors. VGA output makes this 5-bay NAS convenient to display presentation or media files when HDMI is not on hand. To add, users can attach speakers directly to the N5550 NAS to play audio files. With audio out, managing media and audio files is simple; attach the speaker plug to audio out and you’re set to go! Ideal for small installations and/or mobile users, these features are designed to lower the total cost of ownership of your network architecture.